I'm not awake yet. That's okay. I'm going to try to blog anyway. So, yesterday was my visit to the Tor offices. Since we'd gone on a sort-of dry run on the subway past the stop where I needed to get off to visit, I took the subway down, but came up the wrong exit and didn't know which way to turn from my exit. I'm usually not too directionally challenged, but I have had a hard time here keeping myself oriented. I don't know if it's the height of the buildings and being unable to really keep track of the sun, or what, but every time I come out of the hotel, I have to stop and look around and figure out which way is uptown (north) and which way is downtown (south). And then I can get where I'm going. And I always think it's the other way than what it is--or at least a lot of the time I do. I have pictures, and I will post them. Discovered that when I changed batteries in the camera before I left town that I put in an almost dead one. But I have another to put in, so I can take more pictures. Anyway--I visited with Heather a while. We talked to the publicity people and the sales people--they'd just bought an ad for New Blood in RT, which makes me happy. I might get some book excerpt brochures to share around. Just got lots of ARCs to share around, so that makes me happy too. And after all that cool stuff, Heather took me to the lobby, where there were books lining most of the walls, and said "See anything you like? Take whatever you want." Well, geez...that was like setting a miser loose in Aladdin's cave, with the genie gone. I tried to limit myself. After all, I only had a small totebag to carry stuff in. And I still had to pack them in carefully to squeeze them all in. And when I got back to the hotel (on the subway), I had to stop off in the lobby and unpack my bag to get to my wallet where the room key was. But that was just the beginning of the day! I took a nap. And read about half of one of the books (the hardback, because I'm afraid it will make my suitcase too heavy). And then went with our friends the Kellys to see The 39 Steps, which yes, is based on the old A. Hitchcock movie, but done as a comedy spoof. Lots of fun. Then out to dinner, with cheesecake. Yum. More fun on tap today. Will post tomorrow--or whenever I get around to it. Manhattan is an island, not a sand bar, like the island I live on. Lots of water and lots of other islands. Not much in the way of surf--but then I haven't been out to the "beach" islands. There doesn't appear to be any such thing as traffic lanes. If a driver can squeeze a car into a space, he squeezes, forget where the lines are painted on the street. Lots and lots of people, lots of languages. Galveston has as much variety, but not nearly as much quantity. It's really hard to sleep on an airplane. We got up way, way before dawn so we could drive across Houston to the Other airport to catch an early flight. It is actually possible to avoid all traffic slowdowns if you're crossing downtown at 5 a.m. And we had to leave the island at 4 a.m. to get to downtown Houston by 5. Yes, it is that far. Houston comes all the way out to meet us (okay, there are nearly a dozen little towns/suburbs once you reach Galveston County, but it's city all the way.) I kept trying to sleep on the plane, but it kept not working. It was totally wonderful. Loved "The Song that Goes Like This" and "What happened to My Part?" and--well, just all of it. Clay Aiken was "Brave" Sir Robin. One of the understudies did Lancelot, and he was so good I'm scared to think what the --overstudy?--the regular guy would do with it. Anyway, it was heaps of fun. And then we went out to dinner at a Brasilian restaurant, Brazil Brazil. That was quite good too. Today will be a full day--not quite sure what it will be full with, but... I might be able to report back tomorrow. If I can figure out how to get on line, and stuff. Been working the dayjob a little extra because of some trips I've been making, so it's made it tough to get by here and post a blog. And it's been tough to get the writing done. I am just CREEPING along. Bleah. Went to Waco this past weekend for a writing retreat. Critiqued some stories and got a crit. Did some fun writing exercises which might turn into stories later. Others helped me get a handle on characters. It was peaceful--except when the trail riders were giving out awards just outside our cabin-shack where we stayed. Don't have much to share, actually. I'm kinda brain dead. So I'll just let you know I'm still alive. Still plodding through the book. Been out of town, fixing to go again. And working a lot. So. That's my life. One of the places in Galveston that was badly flooded by Hurricane Ike was Rosenberg Library. It's near downtown, where 10 to 12 feet of sea water came in from Galveston Bay, and all that water completely wiped out everything on the library's first floor. Basically, the entire children's library. This first picture is a view looking in from the door. The spiral staircase leads up to the adult section, and the children's library is, I believe, off to the left, if the camera's facing the direction I think it is. You see all the CDs in the right foreground? Mud and salt water isn't good for CDs. They lost the entire children's collection. Not just books, but shelving and chairs and DVDs and CDs and finger puppets and everything. The wave action picked up everything that wasn't fastened down--and some things that were (I think I see part of the front counter in this second picture.) and tossed them around. They do not even have shelves to put books on, so they can't really accept donations of actual books. But if y'all have a few dollars to spare--even just $5--that would go a long way to getting Rosenberg Library to the point where they CAN get books (and other materials) back in the hands of the kids. Right now, the children's librarians are doing mobile storytimes. It's a "You provide the place and kids, we'll bring the stories and fun," kind of thing where people can call and request a librarian with a story. Even with their facility in this kind of mess (and they are beginning to get the mess cleaned out--beginning to), they're providing services. Parts of Galveston, like my neighborhood, escaped with very little damage. Other parts--well, they look like these pictures. (You can see the layered mud on the floor in this last picture--a lot of the books and other materials were sunk in that stuff.) There are so many needs here, so many people that need help. This is the one that speaks to me. Books have made a difference in my life. Books need to be available to make a difference in the lives of the children of Galveston. Y'all can visit Rosenberg Library on their website, where there is a donation button, or you can send a donation to Rosenberg Library, 2310 Sealy Ave., Galveston, TX 77550. (Any donation is tax-deductible.) Anything is appreciated. This is it. The official cover for the upcoming book. 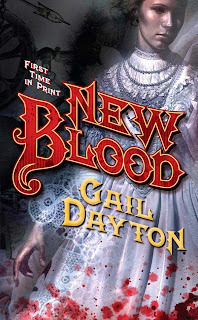 New Blood by Gail Dayton, coming from Tor Books in March 2009. I really like it. Note the Victorian-era type font for the title. See the spiffy steampunk-y gears and such in the background. Note the heroine's white dress. And yeah, there's blood on her skirt. But there are no vampires. Just magic. It's totally different from pretty much everything out there, and ought to catch a few eyes. I'm hoping they're willing to give it a chance. And the blood? There's really not that much spilled in the story. Drops here and there. Well, except during the sword fight. But it's not like buckets-o-blood or total gore or anything. It's a really good book. Nalini Singh says so. And y'all like Nalini Singh's books, right? After she read it, she send me an e-mail. "Read it. Loved it. Must have more." Yep, she said that. Thrilled me no end. So anyway, that's the cover. I mailed my page proofs back on Tuesday. I drove across the causeway to do it Monday, without realizing it was Columbus Day--did not have a clue it was a holiday--but I was still able to go pick up the router and cable we needed to set up the back-up computer, so it wasn't a total waste of the drive. I drove back across (it's only about 3 miles of bridge, but it's another 10 miles to reach "civilization") Tuesday and picked up the mail and got directions to the Hitchcock post office, which is supposedly easier to find than the La Marque post office. I also rewarded myself by going to the closest mall and buying Robin D. Owens' new release (Heart Fate). Then I promptly got lost trying to find the Hitchcock post office. Which was dumb, because it is right there on Hwy. 6. But I turned the wrong way. If I'd turned the other way--if I'd even LOOKED the other way--I probably would have seen it. Anyway, I turned back before I got all the way into Bayou Vista (an actual town, but without its own post office), so didn't take too much time. I'll know for the next time. Still with the slogging on the book. They're about to discover the second murdered body. They stayed up all night hoping to thwart the murderer, but Nooooo-- (Bwah-ha-hah! rubbing hands snidely whiplash-ly) No, it's another dead body. This one deposited by an actual demon in a popular park. So. In island news--we had a rainstorm Monday, and a whole bunch of the stop lights that had actually started working normally Quit, again. I think every stoplight on 53rd street had finally started working right, then the rain came and boom! None of them worked. It was back to 4-way stop sign rules. I think all but one were working properly again today. Avenue O is still being a little hinky. Before-Ike, it was the Avenue Q stoplight that went out every time it rained. Oh well. Three steps forward, one step back. We went out and drove around the West End over the weekend--the devastation there is just heartbreaking. I got pictures of ONE of the giant trash piles on the island. I'll put them up once I get them downloaded. So. I'm going to open with the good news. I just got word. THE ETERNAL ROSE, the 3rd book in my One Rose trilogy, won the 2008 Prism Award for Best Fantasy. (THE BARBED ROSE (book 2) won the Prism in 2007, fyi.) Needless to say, I am totally chuffed. It was fabulous news to come in the wake of all the hurricane disruption. The dead refrigerator is gone from our front curb. So are the branches off the "pine" in the back yard and the other branches. We didn't have much in the way of trash, compared to so many folks. There are two huge, huge vacant lots--one off Broadway near the "entrance" to the island, and one off Seawall somewhere. (I drive by the one on Broadway on the way to work. Haven't been by the one on Seawall.) Anyway, both of these lots are used as a collection spot for the trash and debris picked up by the city, before it's taken off the island by two contractors. The trash is piled 10-15 feet high and covers almost the entire lot that I've seen. The other one is in similar state. They're removing trash from the lots as fast as they can fill up the trucks and drive them off, but more keeps coming. And it doesn't seem as if they've made a dent in the trash and debris piled outside the houses I drive past every day. On the other hand, MY life is pretty much back to normal. Dolly the granddog is home. We finally have all our services back, including internet. The computer is doing strange things (like spontaneously shutting down/restarting every 10 to 20 minutes or so), and may have to go in to the shop, but we have hot showers! And drinkable water! And cable television. All the amenities. I only had to drive across the causeway to work in the Texas City newspaper office for three days once I went back to work this week. The newsroom moved back to the island on Thursday. Now we only have to make the trip over the causeway to pick up mail. They're delivering first class mail to houses on the island now, (which means no magazines, etc.) but the post offices, including the P.O. Boxes, won't open ... well, the downtown post office, where our box was, is "closed indefinitely." However, picking up box mail at the temporary place is a lot easier than picking up residence mail. So we'll probably keep doing that for a while, till they start delivering ALL the mail to houses. The grocery stores are open. Target is open. The junior college and schools are back in session. I feel so utterly grateful that we came through this with so little damage and disruption. Especially when I see all around me people who are dealing with the loss of everything they own. Still, as so many of my friends have said, "It's just stuff. Stuff can be replaced." And I still have a book to write. I have been slogging along this week. Four pages most days, though today, I only wrote one. I got my page proofs yesterday. These are the first proofs I've ever gotten that actually look like book pages. (Harlequin sends these really funky looking things...) So I wrote one page, and got to work on the proofs. Because of the disruption on the island, the proofs got returned to Tor the first time they sent them, so my original deadline's been extended, but I think I ought to be able to get them in the mail by that date, if not back to them. And I still want to write at least a half-page every day before I start working on the proofs. They're pretty clean, so it shouldn't be too tough.